Sports' two most intriguing words: What if? At the end of my Basketball Blog two weeks ago, I wrote about the chain of events that led to Kevin Garnett being traded to Boston. What if the T-Wolves hadn't betrayed KG by quietly shopping him before the 2007 draft? Would Garnett still be stuck in Minnesota? Would he have become the biggest target during the trading frenzy this winter? Did the KG deal create a domino effect that ended up changing the destiny of five 2008 contenders? Want to hear nearly a solid hour of hard-core NBA talk? Listen to this week's B.S. Report as Ric Bucher and Bill Simmons break down the NBA's stretch run. 15. What if Carlos Boozer never screwed over Cleveland? This saga becomes more astounding over time: Inexplicably (the version in which you believe Cleveland would just walk away from an option year worth $700,000 and allow Boozer to become a restricted free agent for no good reason) or explicably (the version in which you believe the Cavs made an illegal handshake deal to "forgo" Boozer's option year, allow him to become a restricted free agent, then sign him to a $41 million deal), the one thing we know is Boozer used his newfound leverage to sign a six-year deal with Utah for $68 million and screw over Cleveland's benevolent, blind owner in the process. A. Boozer blossomed into an All-Star power forward and one of the best 20 players in the league, someone who would have been the perfect sidekick for LeBron James. B. Because Boozer bolted Cleveland, that eventually left the Cavs with a ton of cap space ... and, um ... (take a deep breath, Cavs fans) ... the Larry Hughes, Damon Jones and Donyell Marshall signings. Ouch. C. Had they kept Boozer and signed Jones as well, the Cavs could have been the first NBA team to start two players with visible chest hair since the 1953 Fort Wayne Pistons. 14. What if Jason Williams never crashed his motorcycle? After all the doom and gloom in Seattle, we finally got some good news on the Sonics situation late last week. A group of local investors, headed by Microsoft CEO Steve Ballmer, announced a renovation proposal for KeyArena and a bid to buy the team from Clay Bennett. Our friends at Save Our Sonics are encouraging any readers who live in Washington state to call the legislature at 1-800-562-6000 and offer their support for the arena plan. With the current legislative session ending Thursday, it's imperative to get some sort of deal done in the next week. It has been so long, I feel like I have to add this disclaimer: We're talking about the Jason Williams from Duke (who later shortened his name to Jay Williams) -- not Jason "White Chocolate" Williams or Jayson "The Guy Accused of Killing A Chauffeur" Williams. Anyway, not a week goes by without some troublemaking reader sending us a "bad" prediction from my archives to make me feel stupid -- at least, I think that's the goal -- and one of the leading "somethings" comes from 2003, when I predicted Williams (the No. 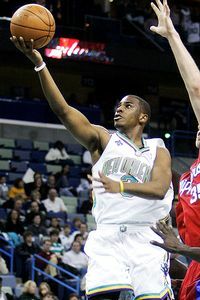 2 pick in 2003) would be a better pro than Yao Ming (the No. 1 pick). Well, you know what? I was right. I was DEAD right. A lightning-quick, physical 6-footer who would have been unstoppable after they changed the hand-check rules in 2004, Williams had his moments as a rookie, including the 26-14-13 he slapped on J-Kidd and the Nets. He would have been a stud. There's no doubt in my mind. But Williams stupidly crashed his motorcycle that summer -- I say "stupidly" because there's no acceptable scenario when a professional athlete with a chance to sign a $70 million contract some day should ever own a motorcycle -- and that was that. How did Jay's injury change what transpired with Chicago over the next five years? Imagine Utah only getting one season out of Deron Williams and you have some idea. 13b. What if Kevin McHale had taken Chicago's "Godfather" offer for KG before the 2006 draft? Here was the offer: Tyson Chandler, Luol Deng and the No. 4 overall pick for Garnett. Imagine Kevin Garnett, right, in Chicago, Jason Kidd, left, in San Antonio and Paul Pierce in L.A. It all could've happened. Let's say McHale does the deal. And let's say he takes LaMarcus Aldridge with that No. 4 pick. And let's say he takes Brandon Roy at No. 6 and doesn't foolishly swap Roy for Randy Foye (a swap that never made sense, by the way). Suddenly, the T-Wolves have a nucleus of Chandler, Aldridge, Deng and Roy. Wow. And that's not even a stretch. This could have easily happened. Meanwhile, Chicago would have ended up with Garnett, Kirk Hinrich, Ben Gordon, Andres Nocioni and the typical flood of discount free agents and February buyout guys who follow a guy like KG, and on top of that Garnett would have ignited Chicago as a basketball city just like he ignited Boston (and potentially pushed the Bulls into the NBA Finals in a weak conference last spring). Instead, they gave away Chandler, turned Aldridge into Ty Thomas and wasted all their cap space on Ben Wallace. So, um ... that kind of sucked. 13a. What if McHale had taken G-State's "Godfather" offer for KG during the 2007 draft? Here was the offer: Monta Ellis, Al Harrington, Andris Biedrins and the No. 8 pick (Brandan Wright) for Garnett. As much as I love Al Jefferson, the T-Wolves would have gotten four starters out of that deal, including a franchise guard (Ellis, suddenly the next Dwyane Wade), an up-and-comer (Wright, suddenly being compared by everyone to Chris Bosh), an athletic rebounder/shot-blocker (Biedrins) and a quality veteran (Harrington). I thought they were crazy for passing up that deal last summer ... but now, with the way Ellis has been lighting it up lately? My God. Do you think Chris Mullin just spends 24 hours a day sighing in relief that the deal never happened? I would. By the way, I'm starting to think McHale might not be a very good GM. 12. What if the Mavs had re-signed Steve Nash in 2005? I defended Dallas for passing on Nash because (A) he hadn't looked good in the previous two playoffs and (B) $60 million seemed like an obscene amount of money for a 31-year-old point guard with serious back problems. What I didn't defend was Dallas subsequently using that money (and even a little more) to spend $73 million on Erick Dampier. If you're throwing money around, throw it at Nash over a dog like Dampier, right? 1. What if Shaq and Kobe had been able to juggle their egos and get along in L.A.? 2. What if Darko Milicic had turned out to be a stud for Detroit? 3. What if Grant Hill could have somehow stayed healthy in Orlando? 4. What if Chicago had fired Scott Skiles in 2006 instead of giving Tyson Chandler away and blowing its cap space on Ben Wallace? 5. What if Tim Donaghy had officiated Games 3 and 6 of the 2006 Finals? To make matters worse, the Mavs made a fatal mistake by underestimating the aforementioned rule changes that transformed Nash into the two-time MVP. Had they kept Nash and Antawn Jamison (sent to Washington for Jerry Stackhouse and the rights to Devin Harris) and still made the semi-brilliant Jason Terry trade, that's suddenly a monster roster: Nash, Nowitzki, Jamison, Terry, Josh Howard, DeSagana Diop, Veteran Free Agent X and February Buyout Guy X year after year after year -- as well as the league's single-most entertaining team. 11. What if Minnesota hadn't ticked off KG during the summer of 2007? A. Using many of the assets originally earmarked for the KG deal, Boston could have trumped Los Angeles for Pau Gasol. B. Without the Lakers stealing Gasol, the Western Conference would have shifted into "No Balls Association" mode. Phoenix wouldn't have rolled the dice with the dangerous Shaq trade, and Dallas wouldn't have rolled the dice by dealing for an aging J-Kidd. Now, you could argue the Celtics could have just made the KG trade in January or February using the same players. But would the deal have been as effective? Remember, the Celtics signed James Posey and Eddie House at discounts once KG was aboard -- that's not happening without the trade -- and they would have had a near-impossible time pulling off a 6-for-1 deal during the season with the rosters of both teams already filled. Throw in KG's trade kicker, and I just don't see that deal happening until the summer, and by that time the Celtics would have moved on Gasol. Then, throw in this wrinkle: When Kobe flipped out before the season, there was a stretch when the Lakers were actively shopping him around, only nobody was willing to offer them a package that included an All-Star + cap space + picks. Well, if they hadn't made the Garnett trade, the Celtics could have offered them Paul Pierce, Theo Ratliff's Expiring Contract (so excited I get to write that again! ), their 2008 and 2010 No. 1s and the future rights to Minnesota's No. 1 (probably coming to fruition in 2011 or 2012) for Kobe and two relatively unfriendly contracts (Brian Cook and Vlad Radmanovic). The Celtics could have kept a foundation of Kobe, Ray Allen, Jefferson, Kendrick Perkins and Rajon Rondo; the Lakers would have replaced Kobe with another All-Star, gotten three No. 1s (including Minnesota's future pick, which could be valuable) and $20 million of expiring contract with Ratliff and Kwame Brown (already on their roster) to make a run at Garnett, Gasol, Jason Kidd or whomever. Everybody wins. Did it work out better for everyone the other way? Absolutely. Garnett revived the NBA in Boston; Kobe calmed down and eventually played his best all-around basketball in seven years; the Lakers stole Gasol from Memphis partly because the Grizzlies didn't have any other serious suitors; Phoenix and Dallas panicked and made two of the most controversial trades of the decade; Miami dumped Shaq's contract and kicked off Tankapalooza 2008; Shawn Marion became the first professional athlete in history to seem happy going from a team with a .700 winning percentage to a team with a .200 winning percentage; the new-look Suns struggled as John Hollinger turned into the Bill Maher to Steve Kerr's George W. Bush; and the Lakers and Celtics have a chance to make ABC $325 billion if they end up meeting in the Finals. Just know none of that would have happened if the T-Wolves didn't tick off KG last summer. 10. What if Portland had never signed Theo Ratliff to a three-year, $36 million extension starting with the '06 season? Imagine life without Theo Ratliff's Expiring Contract? I'm shuddering. 9. What if the Lakers had panicked and traded Kobe before the '07-'08 season? Kobe Bryant might get the trophy for most "What If's" involving one player. By all accounts, the best deal out there was Phoenix's offer of Shawn Marion, Leandro Barbosa and the rights to Atlanta's 2008 pick for Kobe. The Lakers didn't want to trade Kobe to a division rival, so they crossed their fingers and hoped he would calm down long enough for the team to gell. You could say they were showing faith in Phil Jackson's ability to bring Kobe back to the fold, as well as faith in their youngsters (Andrew Bynum, Jordan Farmar, Ronny Turiaf and Sasha Vujacic) to develop into prime-time supporting guys. You could say they had the resolve to keep one of the best three players in the league even though he wasn't happy. Or, you could say they just didn't have the balls to trade him. Whatever the case, their plan worked, Gasol fell into their laps and now (A) they're one of the leading contenders for the '08 title, (B) Kobe is going to win the '08 MVP because everyone has collectively decided he's winning the award even though we're only at the 60-game mark and Chris Paul is just as valuable (if not more) to an equally good Hornets team, and (C) Mitch Kupchak became the first GM from "The Atrocious GM Summit" to work his way off the panel for "The Atrocious GM Summit II," tentatively scheduled for Isiah Thomas' house in Michigan this summer. That Phoenix deal would have been a good one for the Lakers. Not as good as keeping Kobe, obviously, but a nice way to salvage a situation that was heading south fast. Could the Lakers have contended with Marion, Odom, Barbosa, Bynum, Derek Fisher and their young guys? What if you added Gasol and Atlanta's pick to that mix? Suddenly the post-Kobe era is in pretty good shape, right? And would the Suns really have been that great with Kobe, Nash (noticeably breaking down this month, although it's unclear if he's banged up or just getting old), Raja Bell (ditto), Amare Stoudemire (and his scary-bad defense), Grant Hill (and his creaky ankles), Boris Diaw (and his creaky ovaries) and that's it? Is that even a top-six team right now? Anyway, I've written this a million times, but few things drive me crazier than a team refusing to make the best trade possible simply because they'd be sending their star to a rival team. Who cares? Hey, Philly fans, you realize your team could have ended up with Al Jefferson, Rajon Rondo and Boston's 2007 No. 1 pick for Allen Iverson, right? So stupid. (Note: When I'm running the Bucks starting this summer, I'll be making the best deal possible at all times, even if it means I'm sending Michael Redd to Cleveland to dump the Gadzuric/Simmons/Bell contracts for expiring contracts. You have my word on that, people of Milwaukee! I will never be afraid to deal our best player to a rival. Ever. And by the way, YES WE CAN!) So Kupchak deserves to be commended for sticking to his guns and keeping Kobe, but not if he was simply afraid to trade him to a divisional rival ... if that makes sense. 8. What if Ron Artest never went into the stands in Detroit? Wasn't this the biggest NBA moment of the decade? For anyone who watched it live, it was a surreal TV night right up there with Princess Di's death and Buckwheat's assassination. The clip has been watched and rewatched almost as many times as the Zapruder film; it probably has been removed from YouTube for violating copyright restrictions more than any other NBA-related clip. I wrote two columns about it in one week (here and here); I can't remember another event prompting me to write two takes in 36 hours. Along with the Tim Donaghy scandal and the time Darius Miles gave him a full-body hug during the 2000 draft, it's one of the three most traumatic events of David Stern's reign as commissioner, and it certainly has changed the rules with player-fan interactions over the past three years. From a comedy standpoint, it catapulted both Artest and Stephen Jackson into the Tyson Zone, gave us the phrase "pulling an Artest" for eternity and even gave us a chance to imagine what life would be like if Jermaine O'Neal could punch out Turtle from "Entourage." If this hadn't happened, the Pacers might've won the 2005 NBA championship. A. It's quite possible the best team didn't win the 2005 title. 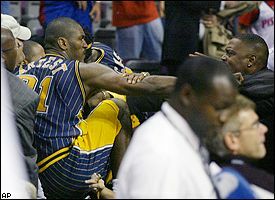 When the Artest Melee happened, the Pacers had just finished throttling the Pistons in Detroit and were staking their claim as "The Team To Beat In 2005." In the span of five minutes, everything went down the drain. And if you remember the shoddy '05 Finals when the Spurs beat the Pistons in seven, it's right up there with the '94 Finals on the "Wait, Are We Sure These Were the Best Two Teams?" Scale. There's no way to prove this, obviously, but I'll always believe Indiana had the best team that season. Although maybe the Pacers were destined to eventually self-combust in some way. Who knows? B. From that moment on, professional basketball was effectively murdered in Indiana. The Pacers have never recovered. Now they have the worst cap situation in the league -- three brutal contracts (Jermaine O'Neal, Troy Murphy and Jamaal Tinsley), one semi-brutal contract (Mike Dunleavy Jr.) and no hope of getting cap space until 2010 at the earliest. Even worse, the fans hated the post-melee team so much the Pacers were forced to give away Harrington and Jackson to Golden State for the Dunleavy/Murphy pu-pu contract platter, putting them in an even worse financial hole. In retrospect, Larry Bird probably feels like Artest and Jackson charged into the stands and started beating the hell out of him. Because that's basically what happened. 7. What if Jason Kidd had accepted San Antonio's $87 million offer during the summer of 2003? See? Even when you're as savvy as Gregg Popovich and R.C. Buford, you still need a little luck. The Spurs won titles in 2005 and 2007 without Kidd, and you could argue they were one miracle play (Fisher's 3-pointer in 2004) and one stupid play (Manu Ginobili's foul on Dirk Nowitzki) from winning four straight. Assuming they landed Kidd, the Spurs definitely would have dealt Tony Parker that summer or down the road (not a good thing), and they wouldn't have had enough money to pay Ginobili without going over the luxury tax, which they refuse to do (and that's definitely not a good thing). Kidd's personal life also could have screwed up their chemistry to some degree -- remember, his ex-wife was a legendary prima donna in Jersey -- and going from Parker (a congenial guy, by all accounts) to Kidd (moody, by all accounts) could have jeopardized the fragile balance of talent and personality that made San Antonio so great in the first place. 6. What if Tim Duncan had signed with Orlando in 2000 to play with Grant Hill? A. If Duncan signs with Orlando, that swings the title in three seasons (2003, 2005 and 2007). We haven't had a "What if?" that definitively swung a title yet. Now we do. B. Once Hill's body breaks down, Duncan finds himself emulating KG's career in Minnesota and squandering his prime on a series of undermanned teams. Those two would have been mirror images of each other -- Duncan wasting away in the East, Garnett wasting away in the West -- and we would have spent those years wondering who was more screwed and who was doing more with less. Bad times all around. C. With Duncan stealing his spot in Orlando, where would T-Mac have ended up? What if he landed in San Antonio to replace Duncan? And what if they still drafted Ginobili and Parker? Could they have won a title with those three guys and Robinson in 2003? Could they have won one without a big guy? Hmmmmmm. 5. What if Kobe had signed with the Clippers in 2004? Just like the Duncan/Orlando thing, this would have been ranked higher if anyone believed Kobe actually wanted to switch L.A. teams. The Clippers organization fervently believed Kobe was coming because he needed a fresh start with a new franchise -- don't forget, this was the same summer when Kobe was getting blamed by everyone for pushing out Shaq and Phil Jackson -- until he broke their hearts by changing course at the last possible minute. Other than the Lakers offering an extra year (and slightly more money), was anything else offered to help stop Kobe from joining a younger and more talented Clippers team? Are the rumors true that they illegally promised Kobe a piece of the Lakers after he retired? Should we read anything into Kobe being represented by Rob Pelinka, the same guy who represented Boozer during another notorious "wink-wink" arrangement that could never be proven (the Utah/Cleveland debacle)? Were the Lakers afraid to seriously shop Kobe before the '08 season because of something promised during those '04 negotiations? It's all hypothetical, and we'll never know for sure until Kobe retires, and we learn if he earned the Magic Johnson "Ownership Discount" from Dr. Buss. But everyone working for the Clippers feels like something happened to trump their offer beyond the dollar figures. They just don't know what. 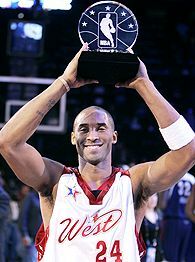 Regardless, this was the single biggest moment in Clippers history -- the time they came within a hair of stealing Kobe and completely changing the face of professional basketball in Los Angeles as we know it. The second biggest moment was when they signed Bill Walton away from the Blazers, and he immediately broke his foot 47 different times. The third biggest moment happened in the second round of the 2006 playoffs, when Mike Dunleavy stuck an ice-cold Daniel Ewing on Raja Bell and blew the Clips' one chance at an extended playoff run. The fourth biggest moment was when they lost a deciding Game 5 in 1990 and ESPN Classic showed the game one day. And the fifth biggest moment was when I nearly made my halfcourt shot on "E:60." Not a fun three decades for the Clips in California. 4. What if Suns owner Robert Sarver said, "Screw it, I'll pay the luxury tax every year?" Well, the following three things would have definitely and unquestionably happened: The Suns would have used the No. 7 pick on either Luol Deng or Andre Igoudala in 2004 (instead of unloading that pick to Chicago for $3 million and the No. 21 pick in 2005); they would have used the No. 21 pick on Rajon Rondo in 2006 (instead of selling it to Boston for cash and the No. 27 pick in 2007); and they wouldn't have traded Kurt Thomas to Seattle along with their No. 1s in 2008 and 2010. Some people would throw in the Joe Johnson deal here (Johnson to Atlanta for Boris Diaw and two No. 1s), but that wasn't a luxury tax move; they made an effort to re-sign Johnson and he wanted to leave. Just for the hell of it, let's give them Igoudala in that '04 draft because he's better than Deng, and they might have taken him anyway. And let's say they don't make the Shaq/Marion trade because they wouldn't have needed to dump Marcus Banks in the deal (they wouldn't have signed him if they had Rondo for one-fourth the price), and besides, they already have Kurt Thomas. Here's your 2008 Suns roster right now: Nash, Barbosa and Rondo as the guards; Igoudala, Hill and Bell at the swing spots; and Stoudemire, Marion, Diaw and Thomas up front ... as well as the rights to their No. 1 and Atlanta's No. 1 in this year's draft. That's not even a pipe dream or an imagine-if-this-scenario-had-played-out roster. Lemme put this in caps for you, S.A.S.-style: PEOPLE, THAT WOULD BE PHOENIX'S ROSTER IF SARVER PAID THE LUXURY TAX ALL ALONG!!!!! Can you imagine? Is that the greatest 10-man rotation of all-time? Would they have won 75 games? We'll never know. What's tragic about the Suns' current situation is how close they came to being positioned for the short term and long term better than any franchise since the '86 Celtics: They would have been the runaway favorites this season, and they would have been set for an abnormally long time because of their young guys. 3. What if the Knicks had never hired Isiah Thomas? This could have been its own bizarro "Where Amazing Happens" commercial called "Where Isiah Happens." Where Phoenix dumps the Stephon Marbury and Penny Hardaway contracts on someone and remakes its team into a contender happens. Where Chicago dumps Eddy Curry for two lottery picks and copious amounts of cap space happens. Where Toronto finds some dummy to take Jalen Rose's contract and aid its rebuilding process happens. Where San Antonio dumps Malik Rose's contract for a center who helps them win the title happens. Where the 2008 Blazers become the most likable young team in the league because they found a taker for Zach Randolph happens. Where a Truck Party happens. Where a humiliating $11 million sexual harassment settlement happens. Where an NBA frontcourt that includes two C-cups happens. Where a 60-year tradition of professional basketball goes down the tubes happens. 2b. What if Atlanta had taken Chris Paul with the No. 2 pick of the 2005 draft? There are no if's, and's or but's about this: Chris Paul will be haunting the teams that passed on him for years. We've made more than enough out of this one, although the better Paul plays -- he's going to replace Isiah as the best pure point guard ever at this pace -- it's slowly becoming the poor man's version of Bowie-over-MJ for this generation of basketball fans, a decision that was relatively inexplicable at the time and became between 10-20 times more inexplicable as the years passed. It's safe to say CP3 will be haunting Atlanta fans. All 527 of them. With the supporting talent the Hawks have in place, you couldn't pick a better team for him. You really couldn't. 2a. What if Portland had taken Chris Paul with the No. 3 pick of the 2005 draft? Ohhhhhhhhhhhhh ... you forgot about this one, huh? On the day of the draft, Portland traded that pick to Utah for the following package: The No. 6 pick (Martell Webster); the No. 27 pick (Linus Kleiza, eventually traded to Denver); and a 2006 No. 1 (which turned out to be the No. 30 pick, Joel Freeland). I'm going out on a limb and saying Portland would love a do-over on this one. Just for the hell of it, let's say the Blazers took Paul. They're still a lottery team the following season, although probably not as bad, so maybe they end up with Rudy Gay at No. 8 instead of Aldridge at No. 4. They're definitely better in '07, maybe a fringe playoff team, so let's take Oden away from them and give them the No. 12 pick (Thaddeus Young) that year. Which foundation would you rather have if you're a Portland fan? Scenario A: Oden, Aldridge, Webster, Roy, Travis Outlaw, Jarrett Jack, Joel Przybilla, the rights to Rudy Fernandez. Scenario B: Paul, Roy, Gay, Outlaw, Przybilla, Jack, Young, the rights to Rudy Fernandez. Hmmmmmm. Paul and Roy as your backcourt for the next 12 years? Would that have even worked when both guys need the ball in their hands? (Possibly.) Would they have had enough size? (From the looks of it, no.) Would they have played more like a Golden State-type style, and would it have worked? (With the talent on hand, I say yes.) Anyway, if Portland takes Paul, that sets off a crazy chain reaction: New Orleans ends up with Deron Williams instead of Paul; Utah never gets its franchise point guard; Oden and Aldridge land in other cities; maybe Roy doesn't turn into a franchise guard playing second fiddle to Paul; and maybe Paul isn't quite as driven because he's not as ticked off for the next few years after three teams passed on him. I have to say, I like the way it worked out. 1. What if Memphis landed LeBron instead of Cleveland? Take a trip back to the 2003 lottery with me. Imagine if LeBron James had ended up in Memphis. We're sure Jerry West can. We're down to the final two teams. If Memphis draws the No. 2 pick, it goes to Detroit because of the stupid Otis Thorpe trade the Grizzlies made five years before. If the Griz draw No. 1, they get LeBron. Arguably, it's the greatest hit-or-miss moment in the history of professional sports -- like going on "Deal or No Deal," getting down to two suitcases and having a 50/50 chance of winning $500 million. For a few seconds, the cameras show Jerry West, who has the same look on his face Forrest Gump had when he was hooking up with Jenny for the first time. If he had dropped dead right then, nobody would have been surprised. A. Bron-Bron joins a deep Grizzlies team good enough to win 50 games that season without him. Better than starting out on a lottery team with Ricky Davis and Darius Miles, right? B. Picking second, Cleveland takes Carmelo and builds around him and Boozer. Since Denver's Kiki Vandweghe took Nikoloz Tskitishvili over Amare Stoudemire in 2002, it goes without saying Kiki would have been dumb enough to take Darko at No. 3 over Chris Bosh. The rest of the draft probably unfolds the same way, although Chad Ford still has Macij Lampe going No. 9 to the Knicks. C-1. At least eight to 10 teams would have spent the '06 and '07 seasons carving out enough cap space to make a serious run at LeBron. C-2. You would have read roughly 200 billion words and heard nearly 200 billion words uttered about the previous paragraph. And that's a conservative estimate. C-3. There's a good chance Marc Stein's head would have exploded at some point from following 35 hot LeBron rumors at once. If it happened on the "Coast To Coast" show on ESPN2 in HD, even better. C-4. There's no way Isiah would have planned ahead to LeBron being available in '07, inadvertently knocking New York out of the LeBron Sweepstakes and leading to a summer of rioting in the streets of Manhattan the likes of which we haven't seen since the '77 blackout and the Son of Sam murders. C-5. Jersey would have cut ties with Vince Carter, dealt J-Kidd for cap space and carved out enough room to reunite Bron-Bron with his buddy Jay-Z as the star of the Soon-to-Be Brooklyn Nets. Meanwhile, Orlando would have been throwing Rashard Lewis' money at him and offering him the chance to play with Dwight Howard for the next 10 seasons. Soon-to-Be-Brooklyn and Jay-Z ... or Orlando and D-Ho? Hmmmmm. C-6. LeBron's departure swiftly kills basketball in Memphis, leading to the Grizzlies eventually moving to England and becoming the London Hooligans. Actually, that could happen anyway. Final note: In two years, the Soon-To-Be Brooklyn piece of Scenario C-5 could end up being realized. (Sorry, Cleveland. You know it might be coming.) 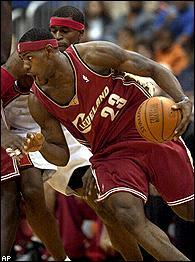 As for everything else in the LeBron/Memphis scenario, it remains the greatest NBA "What If?" of the decade. The good news? We still have 20 months to top it.